Ingestible sensors; brain-mimicking material; self-assembling bacteria sensors. With an aim to help doctors diagnose gastrointestinal disorders that slow down the passage of food through the digestive tract, MIT and Brigham and Women’s Hospital researchers have built a flexible sensor that can be rolled up and swallowed. 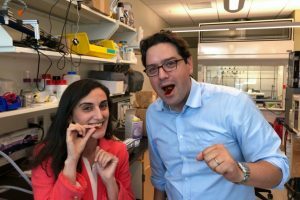 Once ingested, the sensor adheres to the stomach wall or intestinal lining, where it can measure the rhythmic contractions of the digestive tract, and could also be used to detect food pressing on the stomach, to help doctors monitor food intake by patients being treated for obesity. The team explained that the flexible devices are based on piezoelectric materials, which generate a current and voltage when they are mechanically deformed, and which also incorporate polymers with elasticity similar to that of human skin, so that they can conform to the skin and stretch when the skin stretches. The researchers demonstrated that the sensor remains active in the stomachs of pigs for up to two days and the flexibility of the device could offer improved safety over more rigid ingestible devices. In spite of incredible advances in modern computers, the human brain remain the ultimate learning machine, and in the search to find the best way to build smarter computers, researchers suspect there is promise in materials that act in ways similar to the mechanisms that biology uses to retain and process information. Along these lines, researchers at the U.S. Department of Energy’s (DOE) Argonne National Laboratory, collaborated with Brookhaven National Laboratory, MIT, Purdue University and Rutgers University on a recent study that combined supercomputer simulation and X-ray characterization of a material that gradually ‘forgets,’ which they say could one day be used for advanced bio-inspired computing. But create it they have. The material, called a quantum perovskite, offers researchers a simpler non-biological model of what ‘forgetfulness’ might look like on an electronic level. The perovskite shows an adaptive response when protons are repeatedly inserted and removed that resembles the brain’s desensitization to a recurring stimulus. The team said quantum simulations performed at the Argonne Leadership Computing Facility (ALCF), a DOE Office of Science User Facility, probed the origin of this adaptive response. “When scientists add or remove a proton (H+) from the perovskite (SmNiO3 (SNO)) lattice, the material’s atomic structure expands or contracts dramatically to accommodate it in a process called ‘lattice breathing,’” explained Badri Narayanan, an Argonne assistant material scientist and co-author of the study. Interestingly, when this happens over and over again, the material’s behavior evolves such that the lattice breathing is reduced — the proton “threat” no longer causes the material to hyperventilate. “The material’s electronic properties also evolve with this process,” Narayanan said. As the material responds to protons that scientists add and subtract, its ability to resist an electrical current can be severely affected, and this allows the material to be effectively programmed, like a computer, by the proton doping. Essentially, a scientist could insert or remove protons to control whether or not the perovskite would allow a current. Researchers have recently pushed to develop non-silicon-based materials, like perovskites, for computing because silicon struggles to use energy as efficiently. Scientists may use perovskites in learning machines down the line. But scientists can also take advantage of perovskite properties by using them as the basis for computational models of more complex biological learning systems. It is believed that the perovskite material and the resulting neural network algorithms could help develop more efficient artificial intelligence capable of facial recognition, reasoning and human-like decision making. The researchers are continuing the research to discover other materials with these brain-like properties and new ways to program these materials. Duke University researchers have turned bacteria into the builders of useful devices by programming them with a synthetic gene circuit. The team explained that as a bacterial colony grows into the shape of a hemisphere, the gene circuit triggers the production of a type of protein to distribute within the colony that can recruit inorganic materials. 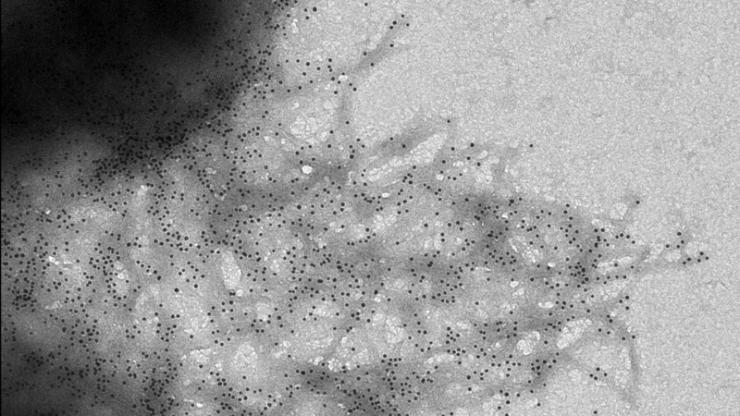 When supplied with gold nanoparticles by researchers, the system forms a golden shell around the bacterial colony, the size and shape of which can be controlled by altering the growth environment.